My patient is a 4-year old, female spayed Poodle-mix breed dog. She has a normal body condition score and weights 13.5 lbs (6.75 kg). She was diagnosed as having primary hypoadrenocorticism (Addison's disease) 3 years ago and has been successfully treated with fludrocortisone acetate (Florinef; 0.1 mg tablets; Bristol-Myers Squibb Company). The problem that has developed is that her Florinef dose has gradually increased over time. Her daily dose has increased from a single (0.1 mg) tablet a day (15 μg/kg/day) to 7 tablets a daily (100 μg/kg/day)! She is stable and thriving at this dose but the cost is becoming prohibitive for the owner. Should I switch this dog over to desoxycorticosterone pivalate (DOCP; Percorten-V, Novartis Animal Health)? If I do that do we have to worry about resistance to that drug also? If I do the transition to Percorten-V, should I start the dog on a higher than normally recommended monthly dose? The "Florinef resistance" that has developed in this dog is not that uncommon (1-3). The reason that dogs become resistant to the action of fludrocortisone (Florinef) is not known, but it's likely related to poor absorption of the drug or accelerated first-pass metabolism of the drug by the liver. If we could give the drug by subcutaneous injection, I suspect that we wouldn't see this drug resistance. Initial and final maintenance doses of fludrocortisone acetate administered to 190 dogs with Addison's disease. The whiskers represent the main body of data. The box represents the interquartile range from the 25th to 75th percentile (the middle half of the data). The horizontal bar through the box is the median value. Outlying data points are represented by open circles. Data from Kintzer & Peterson. J Vet Intern Med 1997;11:43 (1). 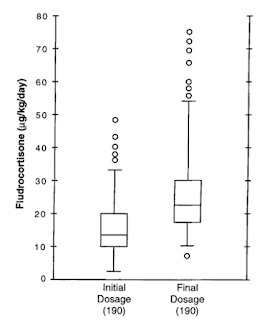 This resistance to the actions of fludrocortisone can be overcome by increasing the dose (see Figure above). So one option that you have would be to change from brand-name Florinef (which is very expensive) to generic fludrocortisone or fludrocortisone prepared by a compounding pharmacy. That would lower the cost of the drug considerably. Your other option, as you mention, is to change to mineralocorticoid preparation over to injectable desoxycorticosterone pivalate (Percorten-V). This is the most effective mineralocorticoid replacement in most dogs with Addison's disease and that should make management of this dog much easier (3,4). The resistance that dogs develop to Florinef doesn't carry over to Percorten-V. In other words, I would not expect this dog to be resistant to the Percorten-V just because she needs a very high dose of Florinef (1-3). 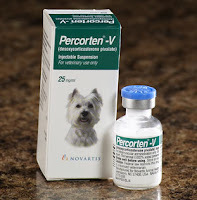 I would start the dog on Percorten-V using the recommended dose of 2.2 mg/kg intramuscularly or subcutaneously (4). 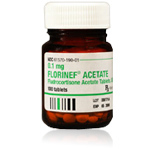 I generally continue the Florinef for the first 3 days after the Percorten injection, and then stop the oral drug. During the first month, I would recheck serum electrolytes at 2 and 4 weeks to help make dose adjustments. Kintzer PP, Peterson ME. Treatment and long-term follow-up of 205 dogs with hypoadrenocorticism. Journal of Veterinary Internal Medicine 1997; 11:43-49. Melián C, Peterson ME. Diagnosis and treatment of naturally occurring hypoadrenocorticism in 42 dogs. Journal of Small Animal Practice 1996;37:268-275. Klein SC, Peterson ME. Canine hypoadrenocorticism: part II. Canadian Veterinary Journal 2010;5:179-184. Lynn RC, Feldman EC, Nelson RW, et al. Efficacy of microcrystalline desoxycorticosterone pivalate for treatment of hypoadrenocorticism in dogs. Journal of the American Veterinary Medical Association 1993;202:392-396.